Can you tell I’m growing a bit impatient for gardening season with all the recent botanical postings? I shot this image awhile back in Gina’s garden. This particular Delphinium might be the “Magic Fountain Larkspur.” The flower usually grows much more upright than Gina’s specimen did, but it’s beautiful regardless. 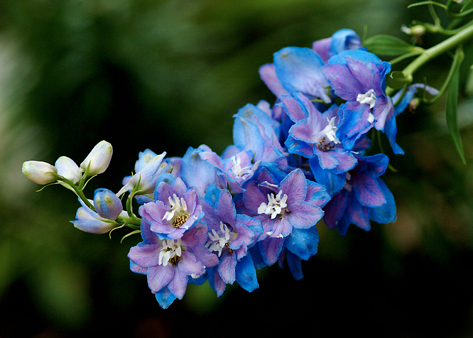 Delphinium, or larkspur, derives its genus’ name from the Greek word for “dolphin” and is suggested by the shape of a gland in the blossoms that secretes nectar. Warning: all part of this plant are poisonous.